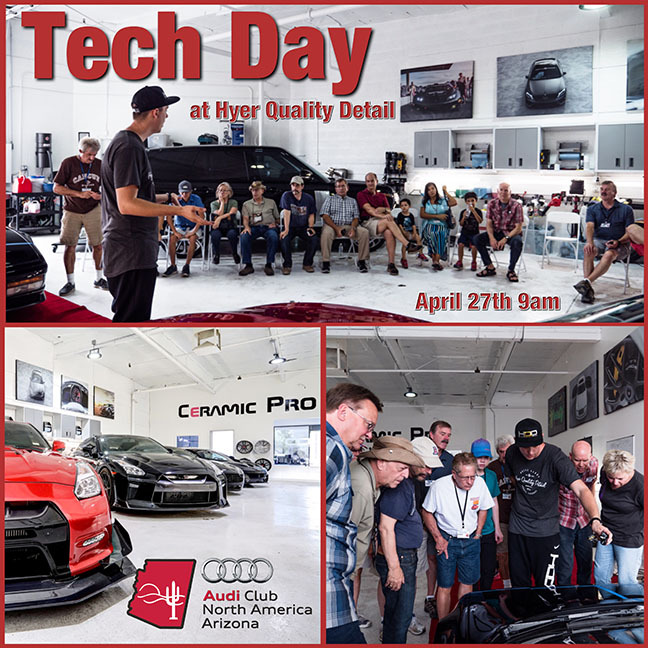 Join the Audi Club of Arizona when we pay a visit to one of our favorite Tech Days subjects with our friends and Audi Club member Hyer Quality Detail. Our buddies at Hyer Quality Detail will present the newest advances in Audi paint correction and protection. We’ll be presented with the latest technological advances in car care and proper protection for your little masterpiece’s longevity and maximum beauty. We’ll learn about coating and protections available like Ceramic Pro with nano technology that actually bonds with your Audi’s surface to create a barrier against oxidation, contaminants, UV damage and quite possibly the Devil himself. But the full wraps and carbon and ceramic window tints we’ll also learn about will save us. Whew! Food and drink will be provided by our gracious hosts, Nichol and Hyer. It’s another great day with your four–ring friends!